This gently sloping lot features a unique 2140 sq ft waterfront, brick home built in 2006. It is situated on 1.4 acres plus leaseback (approx 2 acres total). You can be nearly “OFF THE GRID” in this 3, bed 2 bath home. It has several energy efficient features including, dual insulated (ICF), poured concrete walls, stone surround fireplace, 20 SEER heat Pump unit, energy efficient, appliances & argon filled windows and a 4,000-watt solar panel unit. The current yearly utilities for this home run a whopping $288 a YEAR (3 yr avg.)!! WOW!! A large kitchen with custom oak cabinetry and quartz counter tops has a beautiful view of the lake through a glass patio door. This home has 9-foot ceilings & granite window sills throughout. There is a huge walk in pantry with lots of shelving, separate storage, and generous laundry room and so much more. The fully insulated, 2 car garage even has workshop space. 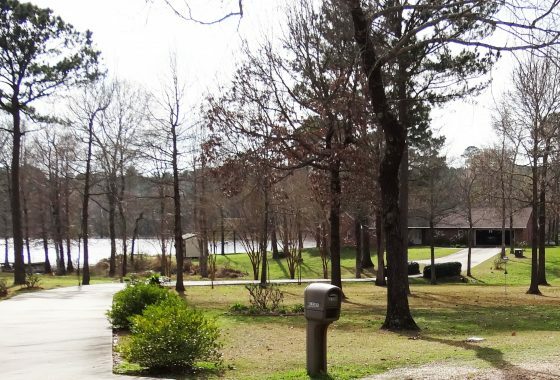 With 280 ft of waterfront, you can easily take advantage of Toledo Bend Lake Life! Enjoy the lake from the yard, the screened in porch or stay inside and view the lake from almost every room. There is a dock on the lake that includes electricity, fish cleaning station, and stairs down to the water. With plenty of water frontage, you have the added advantage of having the room to add your own private boat launch. For more information or to make an appointment, please call or text Jessica Adams 337-368-7765 or Kelly Girouard 318-508-0328.